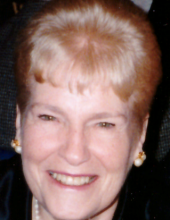 Bernice M. (MacCormack) McNichols, age 86, passed away suddenly at her home in Foxborough on Sunday, January 13, 2019. Bernice was the daughter of the late Mark and Mary (O’Hara) MacCormack. Bernice was born on January 19, 1932 in Boston and was a graduate of Jamaica Plain High School. Bernice was a native of the Roxbury/Mission Hill neighborhood and has been a Foxborough resident for over fifty years. Bernice and her husband Robert were married at St. Thomas Aquinas church in Jamaica Plain on November 10, 1956. Bernice was employed as a secretary for the Plymouth Rubber Company of Canton and Merckens Chocolate Factory in Mansfield. Bernice was also employed by the Foxborough Public School System and Boston Edison. Bernice enjoyed growing orchids, maintaining her gardens and doting over her husband, children, and grandchildren. Bernice was a Communicant of St. Mary’s Church in Foxborough. Beloved wife of sixty-two years of Robert McNichols. Devoted mother of Robert McNichols and his wife Lisa of Gainesville, Florida, Joseph McNichols, and Mark McNichols, both of Foxborough. Loving grandmother of Kristin McNichols and James McNichols of Florida. Sister of the late Hugh F. MacCormack and Elsie Jean Townley. Relatives and friends are kindly invited to attend calling hours on Thursday, January 17 from 4 to 7 PM at the Roberts and Sons Funeral Home, 30 South Street, Foxborough. A funeral service will be held at the funeral home on Friday at 11 AM. Interment to follow at St. Mary’s Cemetery, Foxborough. For additional information please contact 508 543-5471. To send an on-line condolence please visit the funeral home web site at www.robertsandsonsfuneralhome.com. In lieu of flowers, donations in Bernice’s name may be made to the Foxborough Discretionary Fund, PO Box 636, Foxborough, MA 02035. "Email Address" would like to share the life celebration of Bernice M. McNichols. Click on the "link" to go to share a favorite memory or leave a condolence message for the family.